The 7th Powdery Mildew Genomics Workshop 2017 concluded on Friday 15th September, 2017. The meeting followed on from another powdery mildew summer school, which I was unable to attend, and both were well hosted by the Eszterházy Károly University, Eger, Hungary. Here is the poster I will deliver at the Microbiology Society Annual Conference 2017 (3 – 6 April) at the Edinburgh International Conference Centre, Scotland. Next week (Monday 3 April to Thursday 6 April) I will be travelling to Edinburgh, Scotland for the 2017 Annual Conference for the Microbiology Society; my first time North of the border into Scotland. I will be presenting the Powdery Mildew Identification poster. The RHS’ annual horticultural lecture took place yesterday, Thursday 10th November. This event has grown in stature each year I have attended, since beginning my PhD back in 2013. 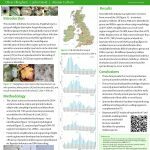 The powdery mildew survey has appeared in the July 2016 edition of ‘The Rock Garden‘, a journal disseminated by the Scottish Rock Garden Club. Unsurprisingly the USA also seems to be full of powdery mildews. The Gallery below shows a small selection of those that have been lucky enough to be photographed by myself.